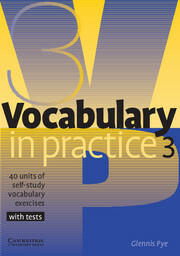 A three-level vocabulary series for both self-study and classroom use. This best-selling series gives students the support they need to master words and phrases in American English. New language is taught in manageable two-page units with presentation of vocabulary on the left-hand page and practice activities on the right. Suitable for self-study or classroom use, the books are informed by the Cambridge International Corpus to ensure vocabulary taught is useful, up-to-date, and presented in a natural context. Firmly based on current vocabulary acquisition theory, this series promotes good learning habits and teaches students how to discover rules for using vocabulary correctly. 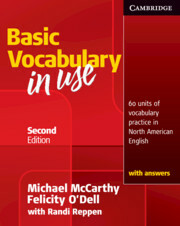 The Basic level teaches approximately 1,200 new vocabulary items. A series of handy vocabulary books aimed at busy learners who want to fit in some extra practice outside the classroom.